Published 2 months ago. About a 4 minute read. White's work highlights actionable ways practitioners can influence consumers to behave more sustainably. 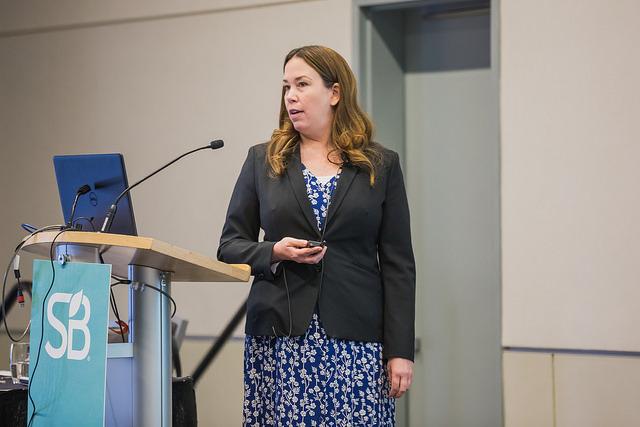 Dr. Kate White is Professor of Marketing and Behavioral Science at the University of British Columbia’s Sauder School of Business. She is Chair of the Ethics and Sustainability Group at Sauder and she holds a professorship in Consumer Insights, Prosocial Consumption and Sustainability. Dr. White teaches courses in consumer behavior, consumer insights and sustainability marketing at the undergraduate, graduate and executive levels. Coining the term "SHIFT" — Social influence, Habit formation, Individual self, Feelings and cognition, and Tangibility — Dr. White’s research examines how to encourage sustainable consumer behaviors, and highlights actionable ways practitioners can influence consumers to care more about sustainability issues and behave more sustainably. I spoke with her after she presented the framework at SB’18 Vancouver to learn more. What is the story behind your idea for SHIFT? Kate White: I had been thinking about this for a while. There is a lot of literature in the behavioral science domain that has a lot to say about encouraging people to be sustainable. But there's not a great review of sustainable consumer behaviors — one location where you can get all of that information, this was the catalyst. As I started thinking about the idea of bringing the information together into a more useful tool, I began categorizing the factors or principles that can influence sustainable consumer behavior. Hear the latest insights, strategies and tools propelling cultural shifts and inspiring consumer desire for sustainability, throughout the week at SB'19 Detroit, June 3-6. I didn't start with the acronym, though I knew I wanted one to help make the ideas more useful, I started by grouping things into categories and letting them naturally fall together. While the categories are ones used in behavioral studies, I also wanted people to catch onto the idea of gently shifting behavior. So rather than being forceful or manipulative, the idea of SHIFT suggests that by reframing how you phrase the question, pose the idea or change the setting, you can more effectively shift consumer behavior. You presented the SHIFT framework at the Sustainable Brands event in Vancouver. What are some of the top take-aways from your session? KW: First, I'd like people to recognize there are five different principles — like, buckets the ideas fall into — and within each bucket there are different tools or strategies to apply the ideas. In the session, I gave examples from each bucket of ideas that have been used and work well. The second take-away comes from a question I frequently get from marketing practitioners: "Which one idea works best." There really is no one "best" answer. You need to know what your goals are; what the target market is; what are that market's needs, barriers, benefits — you just can't go at it blind. Efforts need to be thoughtfully gone through and analyzed by situation and consumer, and then based on what your research indicates, you can determine what factors are the most important. If there was an easy button, your competitors would already be using it. Lastly, this is a chance to consider what your organization is already about, and seeing where you can leverage your unique value proposition. SHIFT, added to your existing toolkits, will help make better decisions. What additional initiatives are you looking at? KW: In my research, I gravitate toward efforts that have larger impact. Like the campaign in Canada to deal with plastic straws is great, but at the same time the government is looking to add another pipeline to facilitate the extraction of more oil, which is many thousands of times worse. Taking care of the smaller issues is important, but one can't ignore the bigger systemic issues in the process. What behaviors can be changed to have the biggest impact? What small scale ideas can be applied to big scale change? A Canadian nonprofit called Our Horizon was started by one guy who wondered what he could do with a small investment that would do greater good. The group's idea is to put labels on gas pumps, like labels on cigarettes, that talk about the negative functions of using gas — giving the backstory, helping people understand the true cost of their consumption choice. What does the "Good Life" mean to you? KW: Part of the good life means not just offering products and services that have sustainability in mind, but offer other things, too — such as societal benefits. Along the line of what William McDonough and others talk about — not just doing less bad, but creating more good. What are your ideas on to redesign for the Good Life? KW: That's a huge question, but it comes back to the core idea of considering multiple outcomes. Like not just focusing on, for example, how can I save the most money, but how can I also offer the most to the consumer, and what are the environmental and societal impacts? Also important is creating ways to help consumers make more positive choices. Show Me the … Health Benefits?